The Trawler Beach House: Rain, Rain, Will You Ever Give Us A Break? 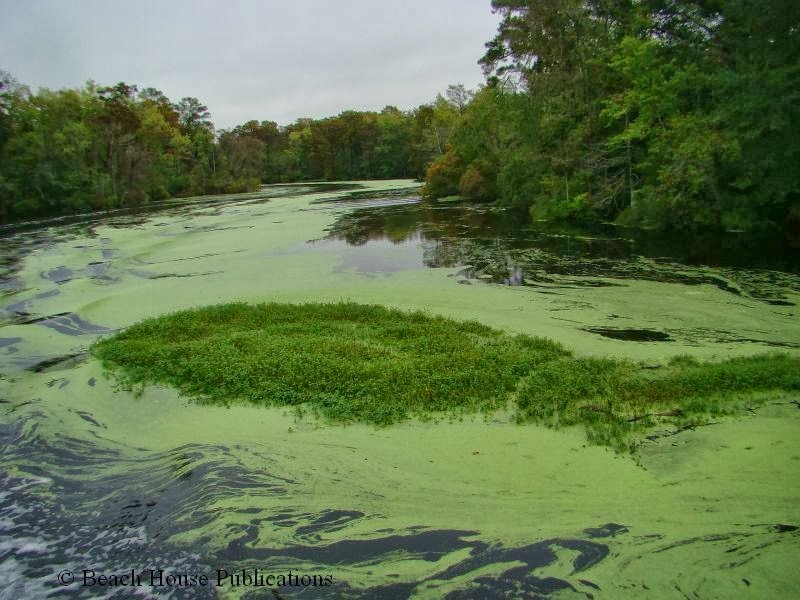 We reported earlier about the Duckweed we had encountered after we passed through the Deep Creek Lock at the northern end of the Dismal Swamp Canal. 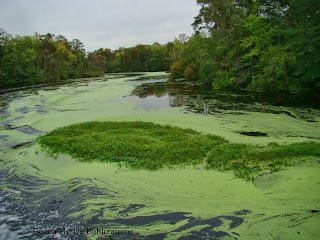 Now, nearing the southern end and the Pasquotank River, we encountered much more of the weed and many floating islands of plant growth. The blanketing of the water made seeing floating logs and debris very difficult, if not impossible. The smaller branches were not too much of a concern, but we had seen much larger logs floating in some of the more open, clearer water. These larger pieces of debris can do serious damage to propellers or even the bottom of the boat. There is also the issue of the engine's sea strainer getting clogged and causing the engine to overheat. If left unchecked, this can cause serious engine damage. Our only choice was to keep a very close eye on the temperature gauge and listen closely for the water flow alarm that we installed on the fresh water intake. These are the times when the alarm install proved to be a good addition. Once again, we made it through the weed without any issues. We do know of one boat that had overheating problems and had to turn back, under tow, proving that it can be a serious problem. How serious seemed to depend on how low the water intake happens to be from the waterline, since the weed floats just at the surface. A boat moving through the water can stir it up. 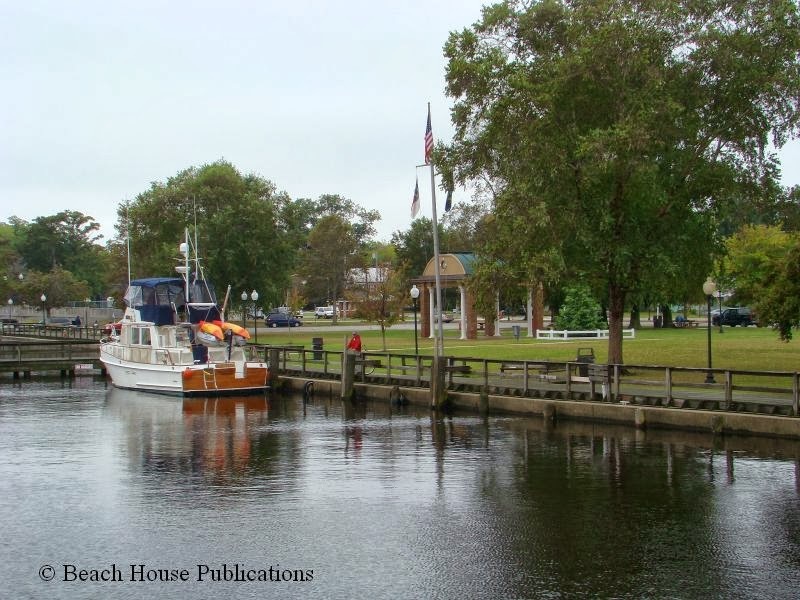 As we arrived in Elizabeth City, we were surprised to see only a trawler and a sailboat at the town docks or tied to the seawall. We tied Beach House to the wall at Waterfront Park behind the trawler Twins, which we had seen in Rhode River. They were also rafted outboard of us for a night at the Welcome Center Dock. 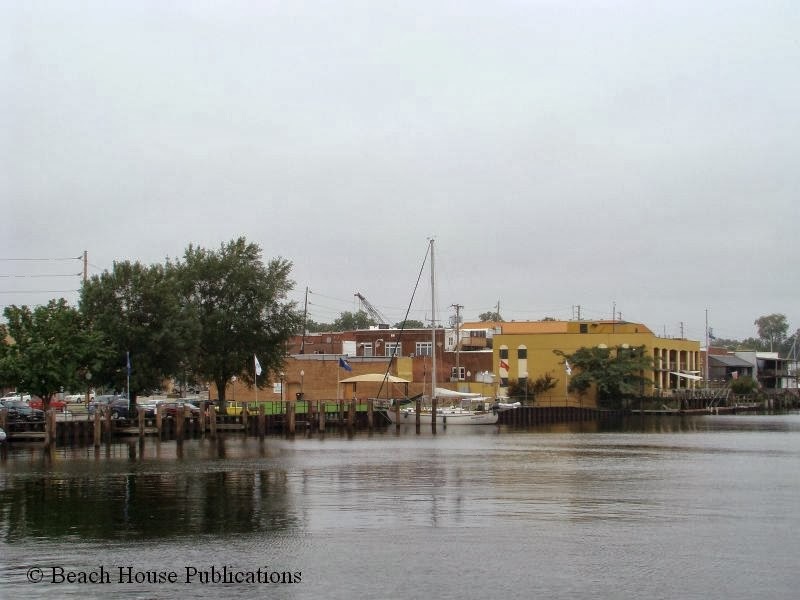 The printer for our books is located in Elizabeth City and he had a shipment of recently printed copies of both the Norfolk to Key West and The Bahamas books to drop off to the boat. The next morning we moved over to the wall at Mariner's Wharf, just across the harbor. The Saturday Farmers Market is held there and we needed to stock up on fresh fruit and vegetables. Unfortunately, because of all of the rain, only two vendors showed up, but we bought plenty from them. We spent a quiet night at the seawall after a great dinner at The Cypress Creek Grill, just across the street. But the next morning, the weather began to turn and the winds picked up from the wrong direction. In any easterly winds, and southeast especially, the harbor can be very uncomfortable, and being side-tied to the wall can be downright serious. The winds continued to pick up all day, and even from the northeast, the harbor was getting sloppy. By around 2:00 pm, the forecast was for rising winds with gusts to 30 knots by overnight and into the next day. This would be no place for us to ride out the weather. 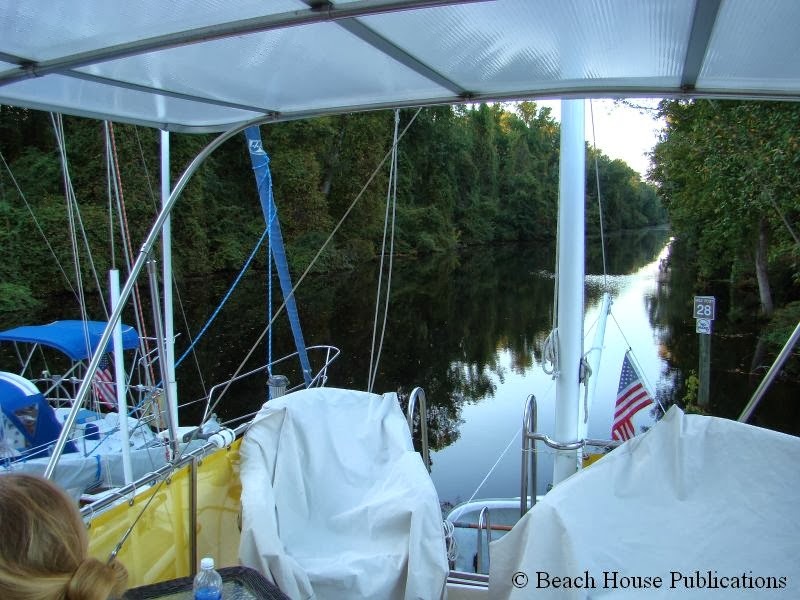 We had two options - go back upriver and find a good place to anchor for the predicted northeast winds or find a marina to spend a couple of days. 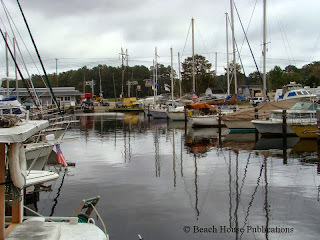 We hadn't been in a marina since the boat was hauled in North East, MD for bottom paint a month ago. Staying in a marina for a couple of days until the winds blew out would give us a chance to wash the boat, do some laundry and get a few maintenance chores done. The marina choice was the logical option to choose. 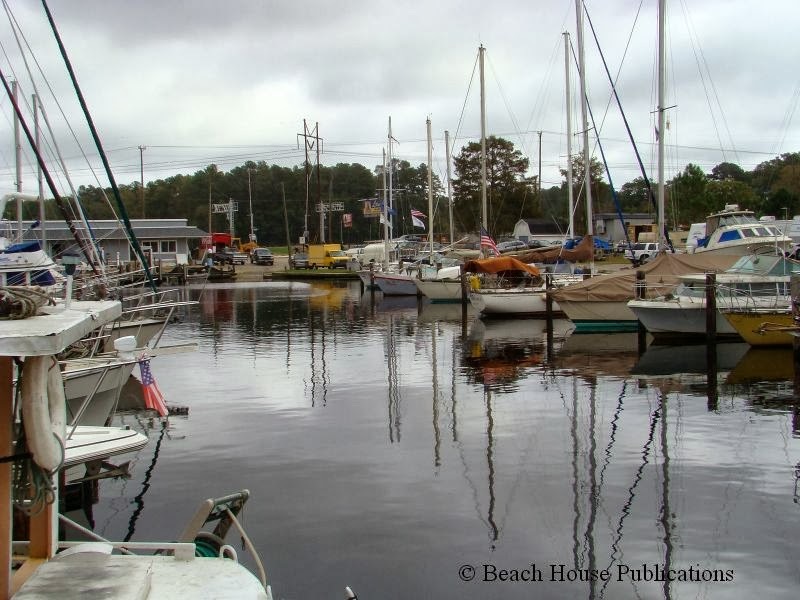 There are only a few marinas in the Elizabeth City area and some of those were well protected for the predicted weather conditions. 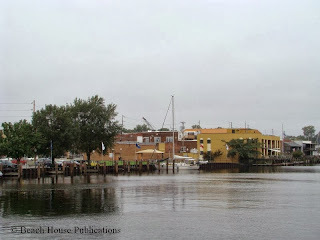 There is a small marina back the way we came called Lamb's Marina, in a very protected basin just off the Pasquotank. It meant backtracking a few miles, but the comfort level was worth it. The marina has a deep channel access, and the basin offers 360 degree protection. This is a funky marina with lots of character boats and some very friendly people. Unfortunately, we found the laundry machines not working, but the dockmaster was kind enough to lend us his car to go into town to visit that laundromat. 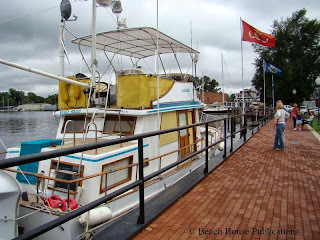 Our dock neighbors are preparing their 34-foot Mainship for cruising and we met a couple of folks who had seen us and stopped by at the Dismal Swamp Welcome Center. The rains have yet to stop, but have at least slowed down to off and on. The boat received a well needed bath, and the leaves and pine needles that were everywhere from being parked under trees were cleaned off the decks and all of the hiding places. By Wednesday, the winds are supposed to subside and we can continue on our way. At least we hope.